Even if you aren't a tech-head, definitely take the time to get familiar with the advanced safety features available on the S Class--not only can they prevent an accident, some of them are simply very cool to use. 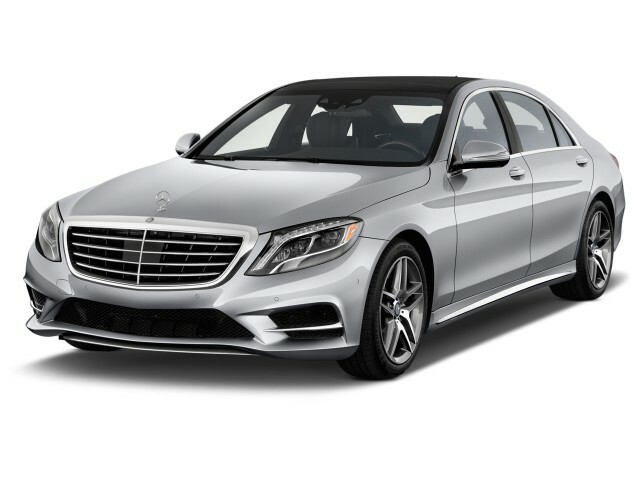 The 2014 Mercedes-Benz S-Class makes an emotional appeal for its claim as the best sedan in the world, and we're feeling it. The Mercedes-Benz S-Class is, for many, the benchmark of the full-size luxury segment. Mercedes says it's the best car in the world. Competing for buyers with such formidable cars as the BMW 7-Series, Audi A8, Tesla Model S, and Jaguar XJ, the S-Class's reign is anything but guaranteed--though the latest generation is unquestionably the best S-Class yet. All of these cars deserve both attention and adulation, but the S-Class's approach to the business leaves no room for doubt: it's playing to win. The newest S-Class backs up its claim with attention to the most minute details, from its personal relationship with the driver to the emotional attachment it inspires in its owners--even if they're firmly committed to the back seat. The new S-Class even provides its own scent to strengthen the bond. A strong, elegant new shape is the start. The S-Class has rarely been the high-water mark of Mercedes design; it's passed through its past three generations from leaden, to graceful, to highly surfaced, but it's never been the definitive statement of style and theme. It's finally ready for a close-up, divorced from the overly busy intersection of lines and swells at the rear quarters, endowed with the kind of cabin that rewards the eyes and fingertips along with the brain. 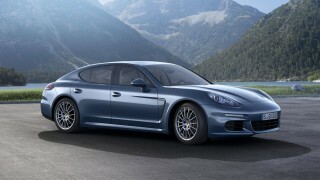 The cool, clinical stereotype of the German luxury sedan couldn't be further from the truth in this case. For the time being, the S-Class rolls with just a single drivetrain. None of the niche offerings in the S-Class family carry over into 2014, at least at launch--not the V-12s, not the turbodiesel six, and not the hybrid. 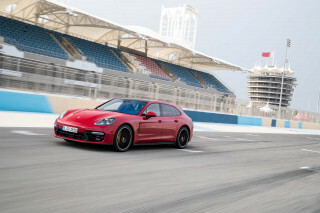 The sole engine and transmission combination is the twin-turbocharged 4.6-liter V-8 engine that was new last year, teamed to a seven-speed automatic with paddle shift controls and a choice of rear- or all-wheel drive. 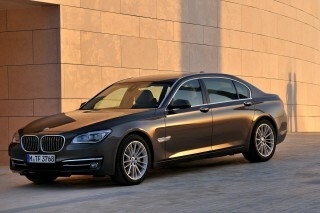 It's an effortless performer, in tandem with the standard air suspension. The tour de force here is an available stereo camera that predicts the road surface ahead of the S-Class, giving it adaptive control over the ride quality to a degree engineers have been daydreaming of since the 1980s. It works superbly well, as long as the S550 is in comfort mode. It takes a real cynic to find fault with the Mercedes-Benz S Class' passenger comforts. The 2014 S550 has spacious accommodations, superb front seats, easy access for those in back, and a fillip of first-class accoutrements to go with occasionally fiddly ergonomics. The First Class Rear Suite option is just that--as close as you'll come to the front of the plane while you're riding in the back of the car. And if anything, its finishes are more beautifully crafted than ever. The tiny knobs that control its round vents aren't as sensually pleasing as the chrome pulls on a Bentley, but the quilted leather dash and silver-toned trim are as glamorous as anything Mercedes has ever made. For those with a penchant for speed as well as supreme luxury, there's the S63 AMG. Re-imagined by the brand's in-house performance division, the S63 AMG gets most of the S-Class's standard bag of tricks, plus a few of its own, including a force-of-nature 577-horsepower, 664-pound-foot twin-turbo 5.5-liter V-8 engine and rear-biased 4MATIC all-wheel drive. The result? A car you'll love to drive as much as to be driven in, and one that can stretch its legs into triple-digit territory with shocking ease. There's no crash data yet, but with Mercedes' long-standing reputation for occupant protection and advanced safety features, the S-Class should be a standout for safety, especially in light of its newest technology. There are cameras and sensors for everything, it seems, from blind spots to surround-views. The adaptive cruise control can steer its way along in stop-and-go traffic, and the car can stop itself from a brisk pace when it senses a pedestrian or an animal in the road. If you'd thought the race to out-coddle, out-soothe the wealthiest of passengers in ultra-luxury sedans was over, you'd be wrong. There's a bit more room inside than before--all U.S. cars are a longer-wheelbase variety--and every cubic inch is filled with systems to nurture passengers. It's fitted with reclining rear seats, airline-style work trays, dual TFT screens for the driver and the car's infotainment systems, and it's enabled for mobile-app connectivity. The seats have a warm-stone massage mode; Burmester sound systems are a pricey but achingly gorgeous upgrade. And, finally, the S-Class has its own scent--one of four perfumes designed for it is atomized into the cabin from a hidden glovebox compartment, on a schedule that doesn't desensitize the nose or permanently odor the cabin. Is it over the top? For drivers who want to be passengers in the best car in the world, there may be no such thing. The 2014 S550 goes on sale in September, as a rear-driver. All-wheel-drive models arrive in November, alongside an AMG edition, with a plug-in hybrid model due to be unveiled at this fall's auto shows. It's inspired and outwardly elegant--but it's inside the S-Class' swoon-worthy cabin where some of the most gorgeous details reside. The S-Class has rarely been the high-water mark of Mercedes design. It's passed through its past three generations from leaden, to graceful, to highly surfaced, but it's never been the definitive statement of style and theme. It's finally ready for a close-up, divorced from the overly busy intersection of lines and swells at the rear quarters, endowed with the kind of cabin that rewards the eyes and fingertips along with the brain. Like the latest E-Class, the S-Class no longer looks like a composite of competing design theories. The grille's bracketed by new banks of LEDs that frame out the headlamps--LEDs also, since there's no incandescent lighting on the new S-Class whatsoever. The clarified look continues down the side, with the profusion of surfaces toned down to a shoulder line that tapers down toward the rear wheel, and a sill line that draws up and in toward the same. 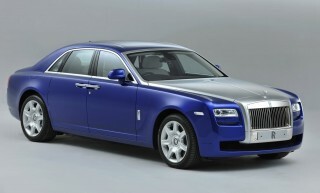 The taillamps are composed from fiber-optic LEDs and wrap more finely around the rear quarters. One pan across its panels, and it's clear the CLS-Class has had an enduring effect on all Mercedes cars. Inside, the cool and clinical air of the stereotypical German sedan couldn't be farther away. The S-Class' phenomenal new interior flips the breaker on every one of those notions. A horizontal bow line wraps the cabin in a continuous flow of stitched leather, while two 12.3-inch high-resolution displays glow from under the dash hood. COMAND and other ancillary buttons are integrated smoothly ahead of the center console. Ambient lighting bathes the cabin in a spectrum of color from discreet locations under the dash's wood trim, from its speaker housings, and from the center stack. It's in the smaller details where the S-Class is more exquisite, more finely observed than ever. The air vents are round now--a spec formerly held in reserve for Mercedes sports cars, now being faired in all vehicles. Not everyone will be pleased by the gaping grin of the two-spoke steering wheel, but it's lovingly appliqued with a signature plate. On designo-trimmed cars, a tiny sliver of contrasting leather is sewn in between dash caps--and the dash itself can be faced in quilted leather. Without a doubt the finest details are the achingly gorgeous Burmester sound grilles--the landau bars incised in their perforated panels deserve a golf clap. From the back seat, the S-Class may be one of the best-performing cars in the world. Drivers? Hang on for the upcoming AMG. As Mercedes pivots from one generation of S-Class to the next, it's paring most of the sedan's drivetrains from the lineup, at least for the time being. None of the niche offerings in the S-Class family carry over into 2014, at least at launch--not the V-12s, not the turbodiesel six, and not the hybrid. The sole engine and transmission combination is the twin-turbocharged 4.6-liter V-8 engine that was new last year, teamed to a seven-speed automatic with paddle shift controls and a choice of rear- or all-wheel drive. The AMG model arrives in the U.S. this November. Power rises in the V-8 in the new S550 application; it's up from 429 horsepower to 455 hp, enabling the car to hit 60 mph in about 4.8 seconds or less, to a top speed of 155 mph. In the last-generation sedan, we found this powertrain to be a real-world joy, with plenty of power on reserve, and just a little turbo whistle to augment its surge of acceleration. If you'd like your S-Class to approach Olympian levels of power, there's the S63 AMG, rated at 577 horsepower and a monstrous 664 pound-feet of torque. Despite the punch of the extra power, the S63 AMG gives up little in the way of comfort or refinement--and it even manages to look rather restrained, though a sharp eye will pick it out from the non-AMG crowd. The S-Class doesn't add any weight in its latest generation, thanks to body panels stamped from aluminum, so in the new S-Class, it's almost identical--save for a near-total lack of sound at cruising speeds. The seven-speed automatic shifts imperceptibly, and paddle controls don't mix messages of sport and luxury, no matter what other brands would have you think. Gas mileage is a slight improvement over last year's car, which was rated at either 15/25 mpg with rear-wheel drive, or 24 mpg highway with the added traction of all-wheel drive. This year's car manages 17/25 mpg. Those other powertrains will come along soon, by the way. The S63 AMG reaches the market in November, and a plug-in hybrid version recently made its debut at September's Frankfurt Auto Show; we'd expect the diesel to return shortly, too, along with the V-12s perhaps in a longer-wheelbase body. The real focus of the new S-Class comes in composure, in honing its steering and handling to an even higher level of comfort. The components are familiar--there's an independent setup front and rear, with AIRMATIC air springs and adaptive dampers on the base versions, and the S550 steers via electric motors. The dampers can be toggled from comfort to sport, as can the steering and throttle inputs. An optional Magic Body Control system scans the road with cameras and pre-emptively adjusts to make bumps even less noticeable, without seriously impacting handling or performance. Magic Body Control isn't available on S63 AMG models, but with AMG tuning, the car is supple yet firm, never hinting that it's somehow less able than its more ordinary alternatives. Even in Sport, steering the S-Class isn't as rewarding as any smaller Mercedes sedan; it's light to the touch, and almost without feedback--a reality that's true of the AMG version as well. It's telling that the active-parking, lane-keeping, and following functions of the adaptive cruise control are probably going to be some of the more sought-after upgrades that come with this generation. The hardware that truly impresses is a stereo camera that reads the road surface about a hundred feet ahead of the S-Class. With the data it provides--in daylight or in darkness, lit up by LED headlights--the S-Class' adaptive dampers can "predict" the road surface ahead, delivering an active suspension response that irons out the road ahead to an eerie smoothness. When the cameras sense a big bump in the road, they allow full travel, only to stiffen again when the obstacle's absorbed. 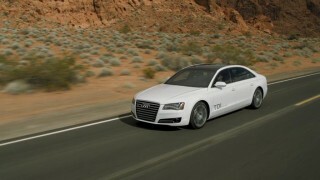 It's capable of doing so at speeds of up to about 80 mph, so long as the car is in comfort, not sport, mode. There's never been so much attention paid to quality in any Mercedes, or to comfort--particularly in the executive-class rear seat package. It takes a real cynic to find fault with the Mercedes-Benz S Class' passenger comforts. The 2014 S550 has spacious accommodations, superb front seats, easy access for those in back, and a fillip of first-class accoutrements to go with occasionally fiddly ergonomics. And if anything, its finishes are more beautifully crafted than ever. 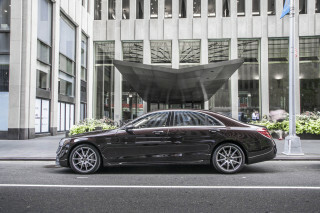 The S-Class is built in two distinct lengths, but for the 2014 model year, U.S. dealers will sell only the long-wheelbase version--dubbed the "standard" wheelbase here, as much for the existence of a shorter car elsewhere, as for the possibility that an even longer car is in the works. The long-wheelbase S-Class body now has a slightly wider track and more shoulder, head, and elbow room, which guarantees plenty of front and rear-seat leg room, even with the front seats powered all the way back. The rear doors are cut widely, for easy access and limousine-like space. The seats themselves are sculpted for good comfort. In front, the 16-way power seats can be controlled via COMAND or door-mounted switches. There's an active multi-contour function that inflates air pockets in response to cornering forces; if it sounds gimmicky, it feels useful and comfortable when the S Class hustles up to higher speeds. The seats are well-padded, heated, and ventilated--and that last feature might be responsible for the one flaw, a hard surface at the back of the bottom cushion. The back seats can be configured in a few ways, from a basic bench seat to a pair of buckets, to the S-Class' most lounge-like seating option ever, its First Class Rear Suite. A pair of reclining chairs with fold-out footrests and a separating console fitted with laptop trays, the suite also has app-enabled seat adjustments and a massaging function that's inspired by hot-stone treatments at a spa. The armrests are heated, even. For utmost comfort, the front passenger seat can be lowered and its headrest removed, so the right-rear passenger can nap on a chaise-style recliner. With the S-Class' larger cabin, you'll rarely find space at a premium, even for the smaller items. There's a large glovebox, and a console large enough for big electronic gadgets. Two cupholders have built-in cooling. And in most versions, the S-Class' rear seat has a fold-down portion and a pass-through to the moderately sized trunk. Fit and finish has few peers in the car world, and the S-Class surely has never looked better. A wide range of leather and wood trim is on the order sheet, everything from silver-hued trim or quilted leather on the dash to sueded leather on the recliner-seat pillows. The S-Class also has a fair amount of "metallized" surfaces--plastic clad with metal paint. It can glint and luster like metal, but to the touch it's not as substantial as real metal, particularly at the climate vents, where the S-Class' tiny knobs miss out on the high ritual of, say, Bentley's chromed vent pulls. Mercedes puts the S-Class' safety on a new level, with lead-and-follow cruise control, advanced night vision, and inflatable rear seatbelts. Because it's substantially new for 2014, neither the Insurance Institute for Highway Safety (IIHS) nor the National Highway Traffic Safety Administration (NHTSA) carries over any crash-test scores for the Mercedes-Benz S-Class. Not that they've had any recently--it's so expensive, and sells in low volume, which puts it low on those agencies' priority lists. Still, with Mercedes' long-standing reputation for occupant protection and advanced safety features, the S-Class should be a standout for safety, especially in light of its newest technology. The 2014 S550 will be sold standard with dual front, front side and rear side airbags; curtain airbags; inflatable rear seat belts; anti-lock brakes, stability and traction control; active head restraints; adaptive brake lights; and PRE-SAFE, which prepares the car when an accident is imminent, by locking doors and tightening seatbelts, and preparing the brakes for full application. From that point, it may be easier to list safety gear the S-Class doesn't have. It doesn't come with a crossing guard. The stock models aren't up-armored. It does, however, get available blind-spot monitors; lane keeping assist; adaptive cruise control with following and steering capability in traffic; forward-collision alerts and prevention with braking; and wipers with embedded fluid jets on both sides of the blades. There's also an available surround-view camera, improved night vision that can throw a spotlight on a pedestrian ahead, to warn them of oncoming traffic; and Active Parking Assist, which can guide the S-Class into either a parallel or perpendicular parking spot. The list of safety features is exhaustive, no doubt. The S-Class' air suspension is programmed to compensate for heavy crosswinds by adjusting suspension stiffness; it factors in torque-vector braking, which applies braking to the inside rear wheel to tighten cornering. Attention Assist, an alert system that senses drowsy drivers and blinks a coffee-cup icon to suggest a rest stop, is standard on the S550, and now it works from speeds of about 35 mph to 120 mph. Finally, the adaptive cruise control has sensors in the steering wheel; keep your hands off the wheel for more than a few seconds, and the screen shows a warning--a pair of red-gloved hands. Nothing exceeds like excess: the Mercedes S-Class has emir-rated rear seats, Burmester sound, and its own scent palette. If you'd thought the race to out-coddle, out-soothe the wealthiest of passengers in ultra-luxury sedans was over, you'd be wrong. The attention to detail in the Mercedes S-Class is more intense than ever. The businesslike way the S-Class goes about its chauffeur duties hasn't gone missing, but it's been massaged with a nurturing take on luxury. The whole Mercedes lineup has become less and less clinical, ever since its failed marriage to Chrysler; the new S-Class' pillowed, scented, remote-controlled, app-enabled, silver-graced cabin is its most sensually appealing ever. The S550 basics include all the features made standard in recent years. There's leather upholstery; dual power front seats; power locks, windows, and mirrors; a sunroof; a power tilt/telescoping steering wheel; and an AM/FM/CD/HD/XM audio system with USB ports, Bluetooth connectivity, and an SD card slot. A hard-drive navigation system is standard as well, and it includes Zagat travel information plus dedicated space for music storage. Also on the standard-features list are active multi-contour front seats; Keyless Go; parking sensors and a rearview camera; a wood and leather steering wheel; ambient lighting; and a power trunk lid closer. 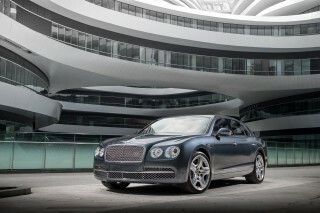 A heated steering wheel, a panoramic sunroof, and a power rear sunshade will be available. The core of the Mercedes infotainment world, the COMAND system, still governs the S-Class' audio, navigation, phone, and climate systems, and some ancillary controls. Some shortcuts for back-seat passengers and for mobile-app connectivity have begun to break down COMAND's grip. An example: to reduce the number of buttons, COMAND has required that you go into screen-based submenus to access some features, like the multi-contour seats. Now there's an app for the back seats. Yes, the seats have their own app, which lets passengers dial in bolstering and lumbar and other functions without spinning COMAND's rotating knob or summoning it through voice controls. American-market cars also have mbrace2, a mobile-connectivity suite that enables audio streaming from Pandora, Facebook posting, and other data services via smartphones, such as read-back of email or text messages. Audio playback comes through a standard 10-speaker Harman audio system, but most S-Class owners will want to opt into the Burmester sound systems, one with surround sound and one with 24 speakers, 3D surround sound, and a $6,400 pricetag. The sound quality is awe-inspiring, as are the details, down to the landau bars incised in the brushed-aluminum speaker grilles, and the way the tweeters rotate in and out of their housings when powered on or off. All infotainment functions are displayed, along with digitally rendered gauges, on the twin 12.3-inch TFT screens implanted into the S-Class' cockpit. The gorgeous displays split driving information off to the left screen, and navigation and infotainment displays to the right. On the right, the screen itself can be toggled for a triptych display of navigation, audio, and direction in a flyover-style readout. Of all the distinctive interior treatments offered with the new S-Class, the First Class Rear Suite is the one that pitches the S-Class from its executive-luxury roots into the Bentley and Rolls-Royce atmosphere. A pair of power-reclining chairs can be lowered, raised, pumped up, warmed, cooled, and be-desked in all the ways passengers are used to seeing in a first-class airline seat. Separated by a console carried through from the front, the first-class option includes a pair of fold-out work tables tucked into the console, cooled cupholders, and a built-in phone dock--in conjunction with the in-car data services, it's a place you can get reasonable work done, even from an iPad, while the twin screens mounted in the front headrests play DVDs. When it's time to relax, the first-class seats have their own "hot stone" massage--a panel of 14 air bladders inflates and deflates in massage patterns--to be enjoyed while the seat bottoms can be cooled. The armrests are warmed, and the side bolsters can be cinched. The front passenger seat can be lowered without a headrest to create a sort of rolling chaise longue, or kept upright and its fold-out footrest used instead. And true enough, the S-Class has its own scent. The built-in atomizer lies in the glovebox, and holds one of four Mercedes-developed scents, or one from the owner's boudoir. It's timed and limited so that passengers won't be desensitized to the smell, and so the interior of the car never clings to the perfume. For now, at least, the S-Class loses its diesel and hybrid editions, but a plug-in hybrid and a new diesel are coming soon. The 2014 S-Class arrived in America in the fall of 2013 with just a single drivetrain at first, leaving the most fuel-efficient models from the prior year on hold. Official U.S. EPA gas mileage ratings place the S550, powered by a twin-turbo, 4.6-liter V-8, at a fair 17 mpg city, 25 mpg highway, and 20 mpg combined. The 2014 figures make the new S550 a notch better than last year's--though it's still a bit thirsty in the grander scheme. The S550 4Matic (all-wheel-drive) scores 16/26 mpg city/highway, and the S63 AMG scores 15/23 mpg city/highway. As a guideline, last year's S550 was rated at 15/25 mpg in the rear-drive S550 and at 15/24 mpg in the S550 with all-wheel drive. In long-distance interstate driving, we've seen 25.5 mpg even when cruising at nearly 80 mph with this engine and the standard seven-speed automatic. In the offing are new versions of the S350 BlueTEC turbodiesel, and a hybrid. 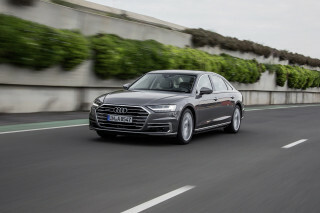 But that gas-electric model won't simply be a restyled S400 Hybrid with a carryover drivetrain--it is a new S500 plug-in hybrid, recently revealed at the 2013 Frankfurt Auto Show but not yet rated for the U.S. market. European gas mileage figures place it at up to 78 mpg, but those figures don't translate well to EPA ratings. Nice car but not sure it's worth the price! Big, quiet, comfortable car with good performance and lots of room.